June’s flower is the rose, and one of the birthstones is the pearl. It was hard deciding what color of rose to base it on, but in the end I did yellow, pink and white dresses pretty recently. Sorry for the brief post, I’ve been looking at a computer a little too long today! The total number of visits my site got between April 1 and 30th was 19,629. That makes Dani’s guess of 19,632 the closest! Congratulations Dani, pick your dress and your colors and let me know your decision! Meet Grace, the second in my new paper doll series! and by the way, may I say belatedly, welcome back! 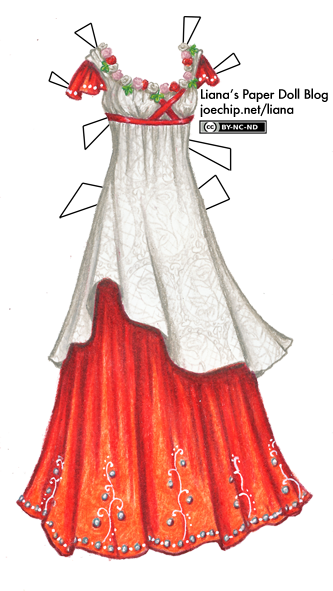 I discovered this lovely website while you were on hiatus recently, and enjoyed going through all your previous posts, including your old journal, and printed out all your designs to keep in a notebook – by far the prettiest paper doll dresses ever! This is probably the most beautiful dress I have ever seen. Is it okay with you if I sew a dress that looks like this? Oh wow this is gorgeous! I absolutely love it. Love the dress love the color love the pearls love you Liana-thank you! So pretty! My aunt’s birthday is in June, I can’t wait to show this to her. OMG! Not only did I win the competition (YES! ), but today’s dress is also my birthday dress (which happens to be on the 6th). I’m very excited! I LOVE the dresses you draw, but I don’t really like the current paper doll. I like the two you have on your old blog (Iris and Sylvia), mostly the faces are the difference. I was wondering if it would be really hard to do a new doll, in the same position as Ivy (so all the clothes would fit) but with a different face, and even hair, maybe? I love this doll, it’s definitely my favorite. This dress is breathtaking. I’d also love to sew something like this. You should be a fashion designer! Your use of colors and forms is so inspired and beautiful. Well this is one of my favorite dresses for sure. But i actually think i like the dresses without the doll, because the doll distracts me and takes away from the dress. But thats just me. This dress makes me wish I had a June birthday! Gorgeous! Congrats to Dani. I love this dress! Not only is it pretty, but my birthday is in June. (Thank you for not making it pink). The detail on the white overdress is exquisite and the design on the red underskirt is really great as well. I have to say I agree with Kimberly on the thumbnail issue. Sylvia is my favorite doll so far, but sadly she has very few things to wear. Ivy seems a little washed out color wise in her face to me. I think that the dress is the most beautiful month dress so far. this has to be one of my favorites you’ve drawn yet! I might just faint. This is so amazingly beautiful.